Radiologic technologists working in California have slightly different continuing education (CE) requirements than those in other states. What is the required California X-ray CE? Most California X-Ray techs need a at least 4 CE credits in fluoroscopy, and at least 4 credits in digital radiography. The remaining 16 can be in anything else that qualifies. Supervising providers such as physicians need 10 credits in Fluoroscopy. Our exclusive curriculum specifically meets your needs for both the CA State and ARRT* requirements at once. A complete package of courses to meet the needs of all California X-Ray techs (except for mammography), for both full and limited licensees. Also accepted by ARRT*. 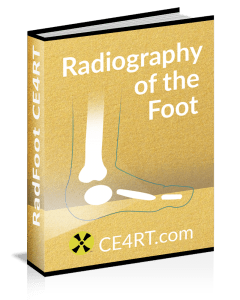 The bundle contains ALARA in Fluoroscopy (5 credits), PACS and Digital Radiography (18 credits), and Radiography of the Foot (1 credit), total 24 credits. This bundle completes California X-ray CE including fluoro and digital requirements and is accepted even if you don't have the fluoro or digital permits. Courses for California technologists and supervising healthcare providers (MD, PA, DC, etc) to meet fluoroscopy continuing education requirements. This course discusses radiation protection in digital radiography. It completes the California digital radiography requirement. Note that ARRT* structured education requirements apply to techs licensed after January 1, 2011 so for those techs requirements might not line up exactly and additional courses may be needed to meet both state and ARRT* requirements. The specific regulations for California X-Ray Tech continuing education are found in the Radiologic Technology Act regulations specified in Title 17, California Code of Regulations (17 CCR). On October 11, 2013, amendments and changes to this act were made. Those changes were based upon the Radiologic Technology Certification Committee’s (RTCC) recommendations. According to CA RHB announcements, those changes began being enforced starting in July 2016. What this basically means is that you now must take specific courses. You will need to get credits in Flurorscopy and Digital Radiography if you have those permits. Proof of completed California X-ray CE credits must be retained for 4 years and must be made available to the CA RHB upon request. Venipuncture certification is also required for California Radiologic Technologists who will be performing venipuncture. For a little light reading, here is the legal code online. This is especially important for CT technologists who are relocating to California from another state. Most technologists native to California acquired the venipuncture certification when they were in school or were grandfathered in. Obtaining the certification later can be tricky. Many community colleges will only offer an extended phlebotomy course that takes a whole semester. There are a few options, however. One option is to look for specific training seminars. There are some, for example, offered by the California Society of Radiologic Technologists. Check their website for updates and details. This is an excript from the actual regulations. Limited Permit X-ray Technologists (XTs) with digital authorization and all Certified Radiologic Technologists (CRTs) need to earn a minimum of 24 approved CE credits, at least four (4) of which are in digital radiography, in the two years prior to the expiration of their certificate/permit. CRTs with a mammography certificate need 24 approved CE credits, with at least 10 CE credits that are specific to mammography. CRTs with a fluoroscopy permit need 24 approved CE credits, with at least 4 CE credits that apply to radiation safety for the clinical uses of fluoroscopy. Any of the mammography or fluoroscopy CE credits that you have obtained that are related to digital radiography may be used to satisfy the 4 digital radiography CE requirements. This link at the state's website explains in detail. The CA RHB, like most states has followed the lead of the American Registry of Radiologic Technologists (ARRT) in defining the CE Requirments. The number of credits is the same for the CA RHB (24 credits per biennium) and credits are equal to the same amount of time as defined by the ARRT in that an “approved continuing education credit” means 50 - 60 minutes of instruction. However the CA RHB has added that the credits are required to be in "subjects related to the application of X-ray to the human body." Limited permit holders in CA have the same requirements as full permit holders. If you are a limited licensed tech (XT), any of the courses on this site will work for you as well. The number of credits you need are the same as a fully licensed tech. (24 each biennium,) but following the new rules, after next July, the subject matter of the courses will depend on which licenses you carry. If you have a digital permit, you will need at least 4 of those credits to be about digital radiography. What this means is that while the ARRT and most state agencies accept CE Credits on subjects such as diseases, ergonomics, and Advanced Cardiac Life Support (ACLS), CA RHB does NOT accept these subjects for credit. They do, however accept courses on diseases and subjects if they include information specific to the application of X-ray to the human body. California mammographers also have specific CE requirements. The state mandates that each mammographer must, in the two years immediately preceding the expiration date of the certificate, must earn 10 of the 24 Approved CE credits in mammography. Trying to keep track of mammography credits is a big challenge. The MQSA requires 15 credits every 3 years. Because of these challenges, we have designed a program guaranteed to meet the needs of Mammographers. Our Mammography courses offer the credits you need.